ViewRanger is well-known as a great smartphone app for outdoor leisure, and is widely used by the Search and Rescue services, but it can also be a valuable tool for those who work in countryside management, such as countryside rangers and nature reserve managers. Dominic North is a countryside warden, responsible for managing Happy Valley, 250 acres of beautiful downland, ancient woodland and hay meadows on the south London-Surrey border. 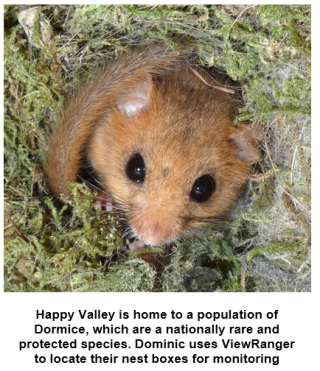 Happy Valley is a Site of Special Scientific Interest (SSSI), and is home to numerous rare species, including ten types of wild orchid, over half of the UK’s butterfly species and the nationally rare dormouse. I use ViewRanger to accurately locate and monitor these populations so that we can fine-tune our site management to benefit them. Most of our monitoring also feeds into national databases and so helps to provide a picture of how these species are fairing at a UK level’. The same goes for recording the rare plants found on the site. 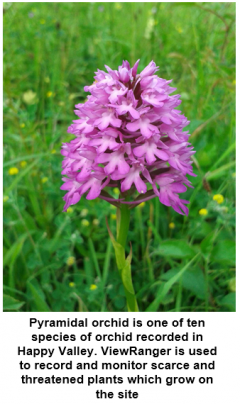 Species such as the man and fly orchid are Red Data List plants, which means that they are under threat of extinction. Often individual plants are found in the middle of large open fields, and would be almost impossible to re-locate without GPS. Again, ViewRanger makes it easy to find them repeatedly by navigating to a point of interest. It’s not just the rare species which we need to record though. 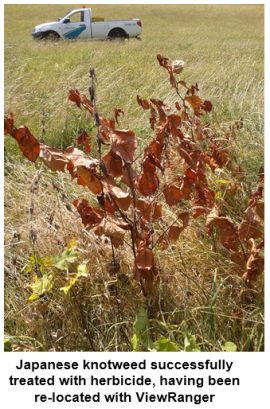 There are some unwanted plants, such as the notoriously invasive Japanese knotweed, which we need to map so that we can return each year to treat with herbicide. On my site the knotweed is often buried in dense brambles and thorn scrub, and it’s a matter of jungle warfare just to reach the plants! Again, by recording each clump as a POI, it’s easy to navigate through the scrub to treat and monitor the knotweed. It’s also possible, and very useful, to add notes to each POI on ViewRanger, to record details of when and how much herbicide was used and how successful the treatment was. In very dense undergrowth it can sometimes be difficult to know exactly where your site boundary lies. By importing the POI’s on to Google Earth, (which shows administrative boundaries) it has been easy to show which areas of knotweed are our responsibility and which belong to a neighbouring authority. This helps to ensure that no areas of knotweed are missed, because managers think that they are on someone else’s land, which benefits everyone in the long term. Being able to move waypoints and tracks between different mapping applications in this way, by exporting the data as GPX files, adds greatly to ViewRanger’s flexibility. Managing an open space is just as much about making it safe and enjoyable for visitors, as it is looking after wildlife. We carry out regular tree inspections, which highlight trees requiring safety work and those which need to be monitored for their condition. Again, by recording these on ViewRanger, it’s easy to re-locate these trees and to give contractors their accurate whereabouts if any safety work is required. On a large urban-fringe site like Happy Valley, there are often hundreds of benches, waymarking posts and information boards which need to be regularly checked for condition and safety. Again, ViewRanger makes it easy to keep tabs on when checks have been made and any work which is required. 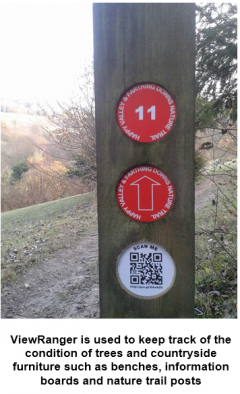 'We have recently launched a hi-tech nature trail enabling visitors to scan QR (quick response) codes on their phones to guide them around the site and to highlight the features of interest. This trail will shortly be added to ViewRanger as a shareable route, allowing visitors with the app to follow the trail using GPS. 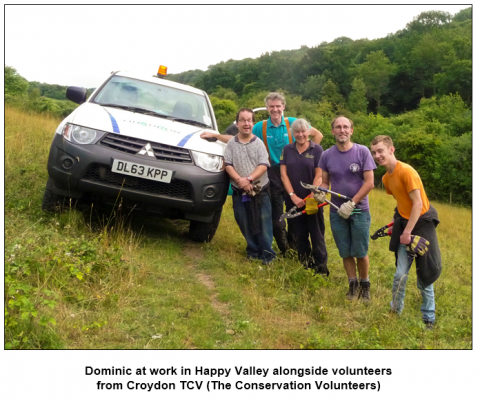 Dominic works as a Countryside Warden for Quadron Services Ltd. on behalf of Croydon Council.